Imagine your travels taking you to historical locations like the Coliseum in Rome, Christ the Redeemer in Argentina, or even Big Ben in London. Well if you are traveling on March 17th this year these landmarks may look a little different then you might expect. For the sixth year Tourism Ireland is lighting up landmarks all over the world to promote their nation’s biggest draw for travelers—St. Patrick’s Day. 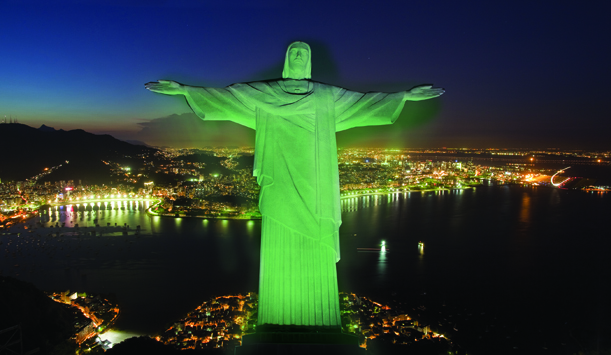 Over 60 million landmarks will be lit up this year at a cost of around €65,000 for Tourism Ireland’s “Global Greening”. Last year the “global greening” trended on social media across the world. No matter where you travel on St. Patrick’s Day this campaign makes it feel like you are in Ireland. “The 2015 Tourism Ireland Global Greening will again help to raise awareness of Ireland as a visitor destination in key overseas markets. The success of the Global Greening from a tourism perspective is in the volume of media coverage that is generated, with images of the greened landmarks forming part of prime-time news broadcasts on stations around the world, and images of the greened venues appearing in print and online publications and being widely shared on social media. It serves to remind people worldwide of Ireland at a time when many are planning their overseas holidays.” Says Ireland’s Minister for Transport, Tourism and Sport Paschal Donohoe. This campaign is an innovative use of the principles of Mead (1937) Symbolic Interactionism. This theory looks at how we as a society derive meaning through interaction and culture. The idea that the color green represents Ireland is something we learn through seeing others associate the hue with the country. Whether that be through green hats on St. Patrick’s Day or seeing people wave the Irish flag with its green coloring, most everyone understands that green is a symbol of Ireland. Tourism Ireland didn’t have to say anything in their promotion, all they had to do is light monuments green on St. Patrick’s Day to put their country in your mind. How effective do you think this simplistic yet costly marketing stunt would be if you saw it? Would you want to immediately pack your bags and head to Ireland, would you be annoyed that a historic monument was being obscured, or would you have no real response? Let us know in the comments! I am very glad that different countries are starting to include holidays and other cultural events into their own country. The only way to end racism and prejudice against different cultures and ethnicity is exposure. This event honoring St. Patricks day may seem small but it is a big step towards to an inclusive world and environment. Great post! My mom was born and lived in Ireland until she was twenty! For my thirteenth birthday I went to visit Ireland, it is such a beautiful place. I think this campaign is successful in getting more people to think about Ireland and attracting more people to visit. I love that they just use the color green and people automatically think of Ireland and its heritage. Of course I would want to pack my bags and go! I love this and I think everyone should go visit Ireland. I think this simplistic and expensive marketing idea is effective if I had the money to travel to Ireland. I would not be annoyed or irritated about a historic monument being lit with green lights. I think it is a cool idea and we should celebrate and acknowledge all cultures around the world. I think it is important for people to be aware of other culture’s history, traditions and festivities. Hopefully, then people will be more accepting of different people and their ethnicity. I don’t know if personally would consider this an effective marketing stunt. If it is that costly, than I definitely doubt if its worth it. If I had seen a green monument I would have immediately attributed it to the area celebrating the holiday St. Patrick’s Day. I would not immediately think to pack my bags and head to Ireland. It would, in my mind, be a marketing strategy that would cause no response in me other than the passing realization that I should probably put green on as to not get pinched. The social media coverage would change the game in a beneficial way. However, I haven’t heard of this nor ever seen it and I wonder how many people have. Is it worth the cost when it will probably make people think more about the holiday itself than traveling to Ireland? I enjoyed reading this post because I actually had no idea this was going on! I felt like even though this is a costly marketing stunt, it is very effective because it is incorporating all of these different countries to participate in this holiday. I would love to travel to Ireland someday, but for all of these different nations to participate in “global greening,” it signifies a unity in this world that we don’t see as often as we should. I think the “global greening” is a great marketing strategy because it makes me want to go see these other monuments alongside Ireland during this holiday and I am sure many others felt the same way.